We understand that when your water heater stops working, you will want a solution as quickly as possible. You can get a better performing water heater installed in your home on your schedule by using our prompt service. We’ll help you decide which water heater is best for your home and family whether you’re looking to upgrade for efficiency or code regulations. There are many models to choose from and we can tell you the pros and cons of each based on years of experience so you can make the best decision. Recognize any of these issues? The repairs cost more than the equipment. After a while fixing a leak-prone water heater can become costly. Purchasing a new one will end up saving you a lot more money. Your warranty has expired. Without a warranty, you could end up spending a lot more on repairs of an old water heater than you would if you upgraded to a new model. You water isn’t consistently hot anymore. Over time mineral scale can build up and negatively impact the efficiency of older water heaters causing them to do a poorer job of providing enough hot water. By calling us you’ll get up-to-date tips on the most popular, energy efficient, and affordable models for your home. We’ll figure out what capacity is best and discuss which features are most important based on your needs. Whether you’re looking to get a water heater that’s electric, gas, tankless, or a hybrid heat-pump system, we promise you’ll be happy with our service. If you aren’t happy for whatever reason, we’ll give you a full refund and uninstall the water heater at no additional cost to you. 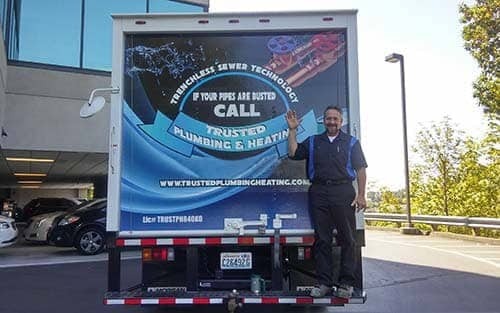 When you call Trusted Plumbing one of our specialists will send a plumber to you on your schedule to do an inspection or give you a free estimate for a new water heater installation over the phone at 206-208-0007. Enjoy having steady hot water again and call Trusted Plumbing. This field is auto-populated based on the keyword the brought the customer to the form. Briefly explain your plumbing or heating needs to receive a free estimate online. Copyright 2019 Trusted Plumbing & Heating LLC. All rights reserved.